Now mind you, I may not love everything about the holiday, [Tangent: I promise I'm not a complete Scrooge (Ebenezer or McDuck), I just have started to loathe a lot of things like 90% of Christmas carols, crowds and conventional mall shopping after I worked in a mall for several years after college. Those things can give a gal PTSD.] but I do love twinkly lights and Christmas decor and have loved cruising to look at outdoor displays since I was a little lady. I imagine as an 8 year old, I marveled at a 4 foot tall Snoopy Snowglobe inflatable and cursed my parents because they just had dumb wreaths and spotlights and those little plastic candles in the window, which inevitably proved to be more trouble than they were worth. I thought my parents were crazy for denying me a 6 foot tall glowing penguin, now I commend their conviction to keep the class is Christmas. Ok. 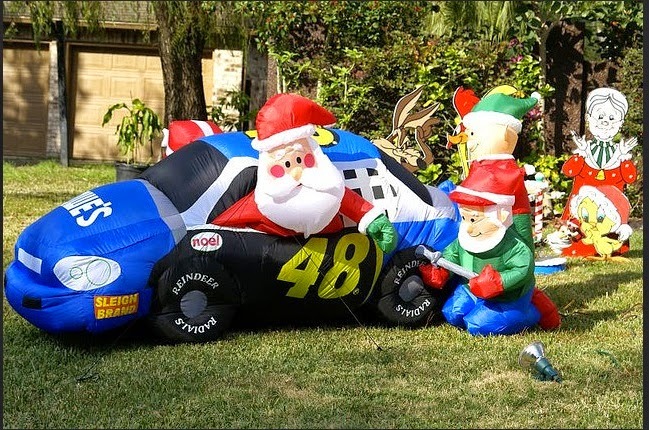 The fact remains that I know very little about race cars, but I do now that Santa is not wearing a helmet and is not properly strapped in, so that car is headed for catastrophe. I however commend Lowe's and their synergistic attempt at shoehorning their branding into Christmas decor.